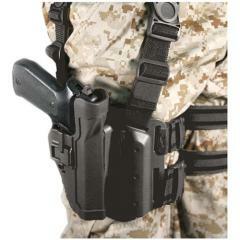 Blackhawk 4305 Level 2 Tactical SERPA Holster FREE SHIPPING! The Blackhawk 4305 Level 2 Tactical SERPA Holster is a secure drop leg carry option for your sidearm. Its breathable thigh platform is adjustable for a comfortable, movement-free fit, and the attached Y-harness distributes the load efficiently and keeps the holster vertical for easy access to the grip. The open top design makes it easy to take up a firing grip for immediate use upon drawing. When returned to the holster, the SERPA Auto-Lock clicks into place to secure the firearm. It features an adjustable tension screw for custom retention, as well as a hole that allows the use of a bungee retention system. Wonderful piece of kit, quick easy draw. A great replacement for my issued holster. Awesome! This holster is by far has the best swivel joints and quick disconnects which makes it comfortable and quick on and off. Make the switch and you'll never wear a weapon on your belt again. Great set up, keeps your weapon readily available and does not dig into your side. ©2002-2019 CopsPlus.com: Blackhawk 4305 Level 2 Tactical SERPA Holster FREE SHIPPING!